The Appointments Committee of the Cabinet (ACC) has appointed senior IPS officer Rajni Kant Misra as the Director General of Border Security Force (BSF). 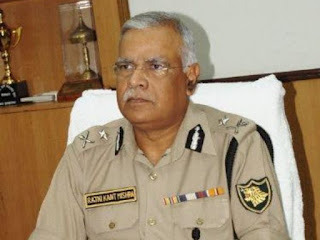 He has been tasked to head BSF for period up to his superannuation on August 31, 2019. He succeeds K K Sharma, who will retire at the end of this month. Misra is a 1984-batch IPS officer of the Uttar Pradesh cadre. Currently he is serving as DG of Sashastra Seema Bal (SSB). BSF is a primary border guarding organisation of India and termed as the First Line of Defence of Indian Territories. It is the sentinels of Indian borders with Pakistan and Bangladesh. It came into existence on 1st December, 1965 in the wake of 1965 Indo-Pak War or ensuring security of borders of India and for matters connected there. BSF is one of the five Central Armed Police Forces of Union of India under the administrative control of Ministry of Home Affairs (MHA). It is mandated with guarding India's land border during peacetime and preventing transnational crime. BSF currently stands as the world's largest border guarding force. It has total 186 battalions with sanctioned strength of 257,363 personnel including expanding air wing, marine wing, artillery regiments, and commando units. It is deployed on the Indo-Pakistan International Border, Indo-Bangladesh International Border, Line of Control (LoC) along with Indian Army and also in Anti-Naxal Operations. Q. Who has the Appointments Committee of the Cabinet (ACC) appointed as the Director General of Border Security Force (BSF)?